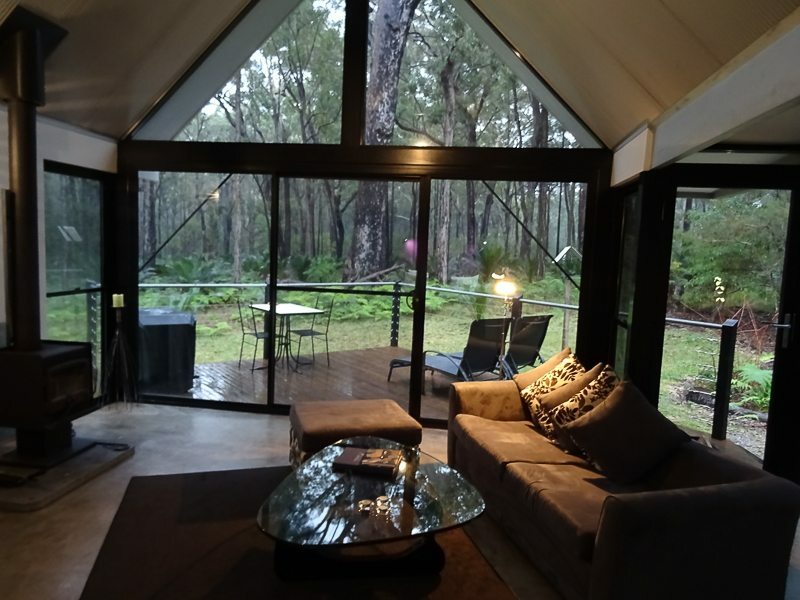 What is a bower you might ask, as we did when we came to the Eurobodalla area of southern NSW, Australia? 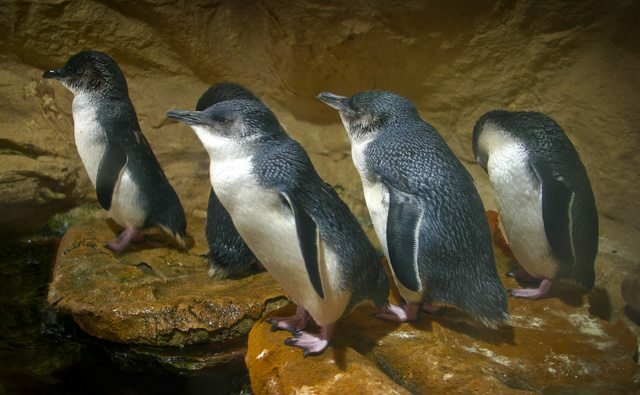 We had come for something unique in itself, to experience nature’s playground, where seals and whales, kangaroos and birds are the centers of attention in this area of Australia. 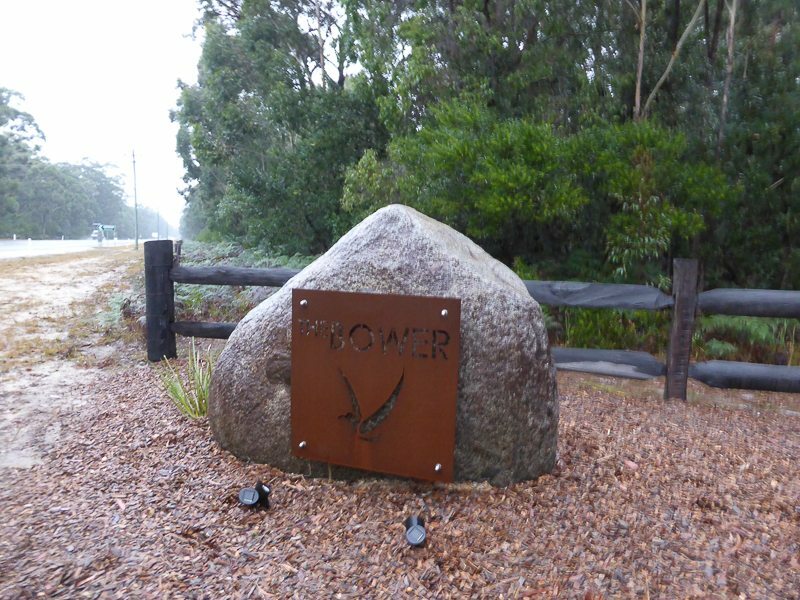 This brought us to the seaside and bush retreat of Broulee and to The Bower at Broulee, which is in the middle of the bush with some amazing walking and cycling trails. So I wondered – what is a bower? 1 So I wondered – what is a bower? 6 So, What is a bower? and how did our definitions go? According to the Oxford Dictionary a bower is a pleasant place under the trees or climbing plants in a garden or a wood, or in literary terms, it is a women’s private room or bedroom. Alterntively, we could look to the bower bird and the bower that they create. The male builds a structure, a bower, to attract and woo a mate and decorates it with bright blue antyhting that is geneally stolen and amounts to bling, in their elaborate courtship ritual. 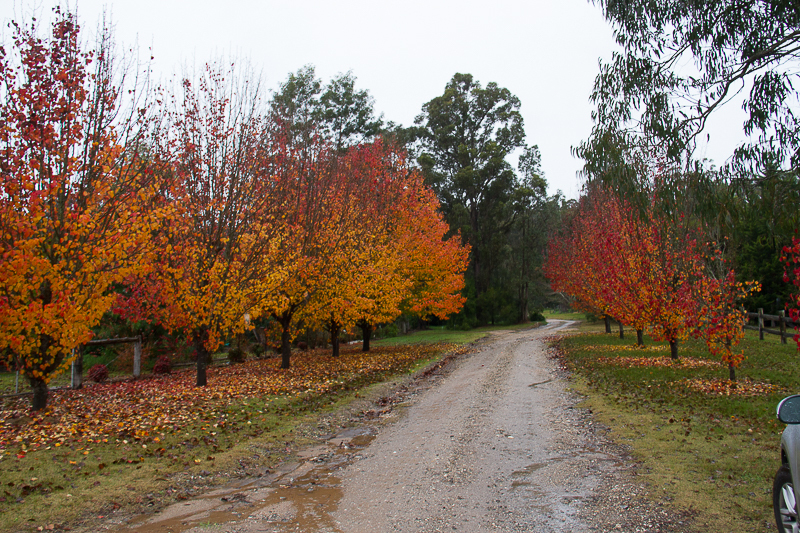 We drove down the coast towards finding out what the bower that we would be staying at would be like. We went through some quite miserable weather, where the rain refused to desist. We drove and stopped at some of the coastal towns of the Eurobodalla, and drove past the turn off to Broulee. The villages that we did visit were each different and each unique. 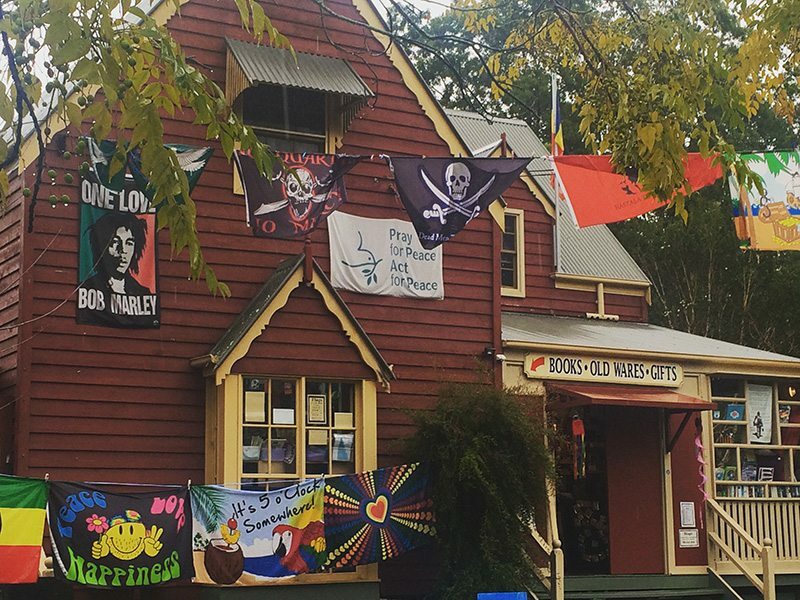 From the angler’s paradise of South Durras, to the very popular seaside village of Bateman’s Bay, we then headed to the utterly delightful old Mogo Town. This is an alternative, historical village big on the cute factor. We then proceeded to Moruya, another village but slightly inland from the others, with some of the best street lamp poles we have seen. 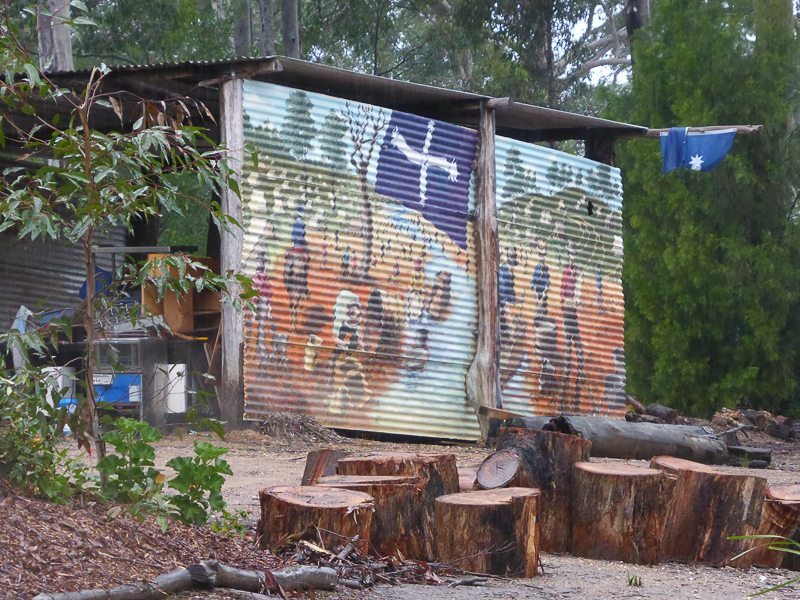 We then took the tourist drive back to Broulee, to see in real life what our bower was, and whether I, as an urban junkie, could see myself living for three days in a bower. We carefully followed the very thorough instructions that we had been given to find our bower at Bower at Broulee. 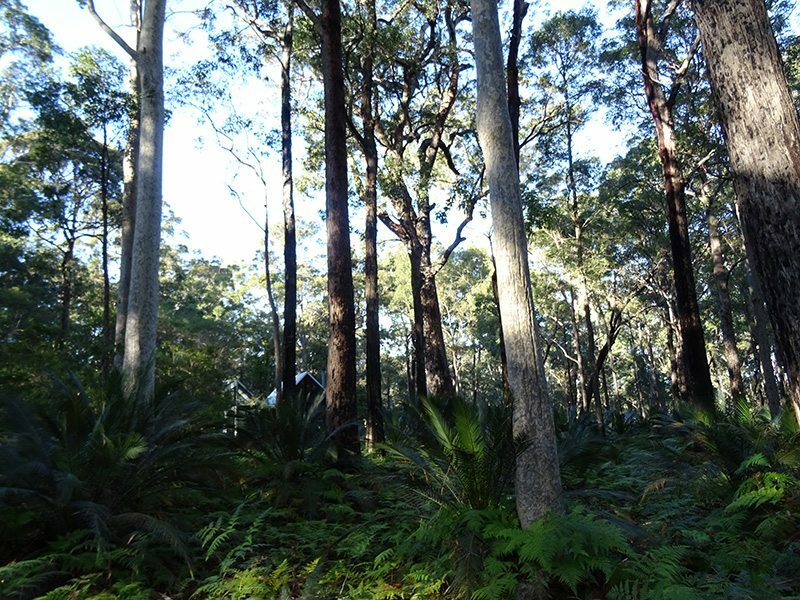 We drove up a road through some very typical Australian bushland, but more particularly, very typical vegetation for the Eurobodalla region of New South Wales. This was eucalyptus and casuarina trees with some amazingly varied undergrowth. We got to the main bower where we very pleasantly greeted by the owner. 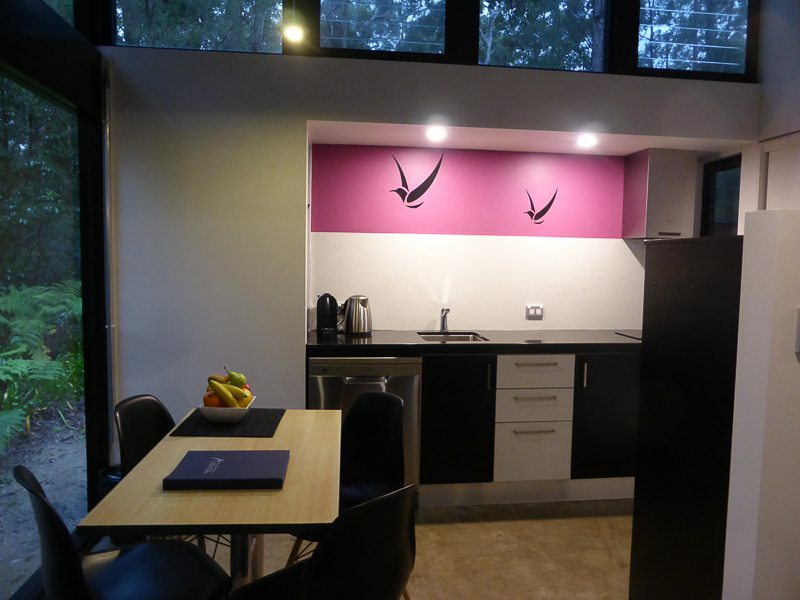 He told us that the philosophy of The Bower is to “recharge together in style”. However, if we needed anything, then he was at hand, to make it so. He explained that we may well be woken by some of the Australian creatures that roam through the bush surrounding the bowers. There was one particularly cantankerous possum that needed to be told to move on if he started a fuss. 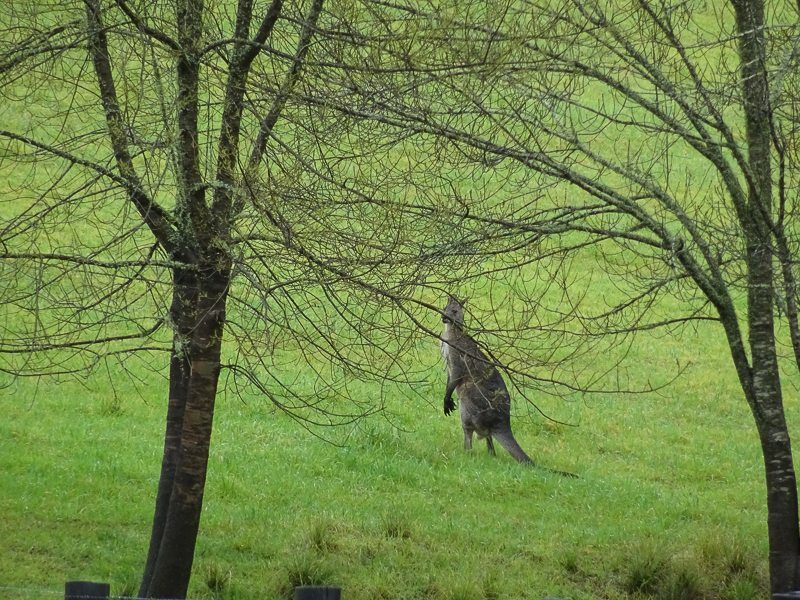 For us as Australians, we are used to the vagaries of our animals, so that was not a concern. He explained that our bower was ready and that they key was in the door. This was when we finally got to discover what a bower was and to live in it. What I can I say? 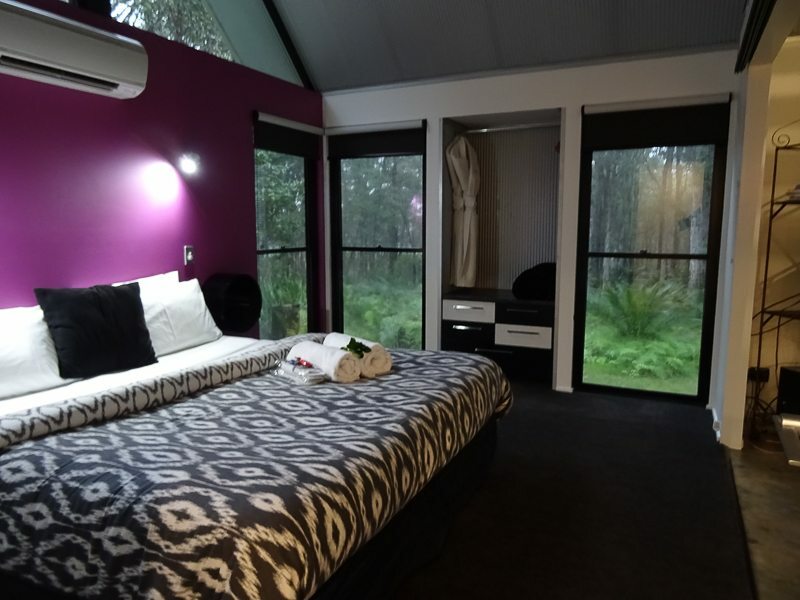 We have been very privileged to have stayed in some of the finest hotels all over Europe and Asia, and our bower at Broulee is right up there and in the middle of the Eurobodalla bush. This may not be what is meant of as nature’s playground, but trust me this is nature’s playground. 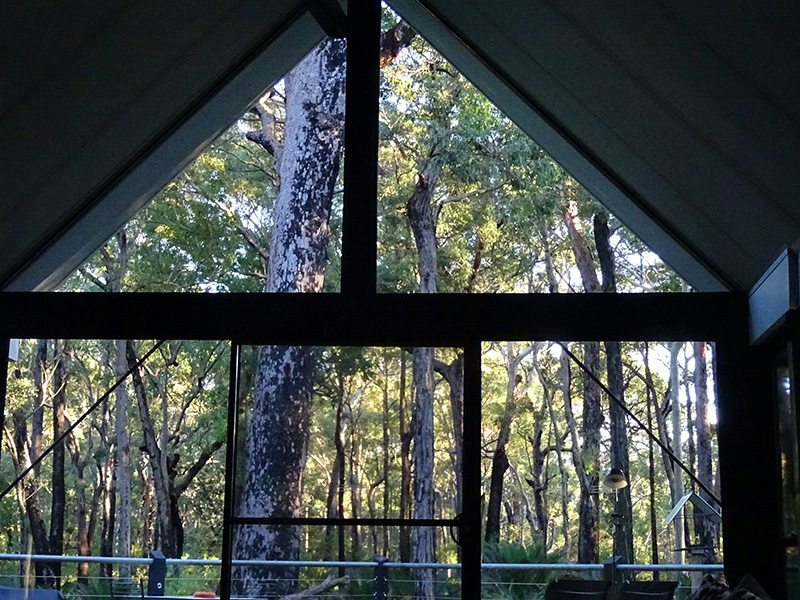 We entered and saw the incredible views of the surrounding bush, through cathedral windows that were in every room and reached to the gables of the bower. This, combined with the chic and on trend décor made our little nest instantly special. We explored this high-end bower from one end to another. It is quite deceiving from the outside because it is much bigger on the inside than what it appears. Our bower is a tardis. 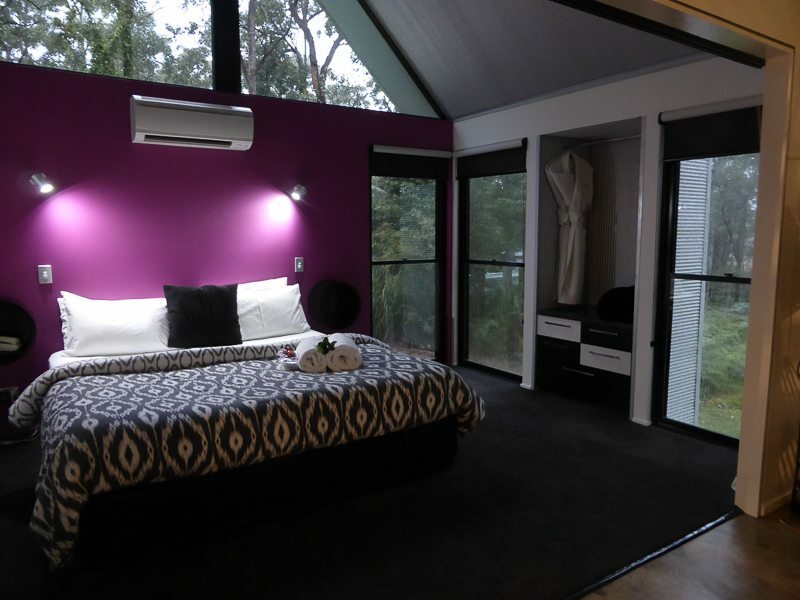 The bowers are designed for couples, and this is evident from the moment you enter that you definitely can recharge and definitely in style. 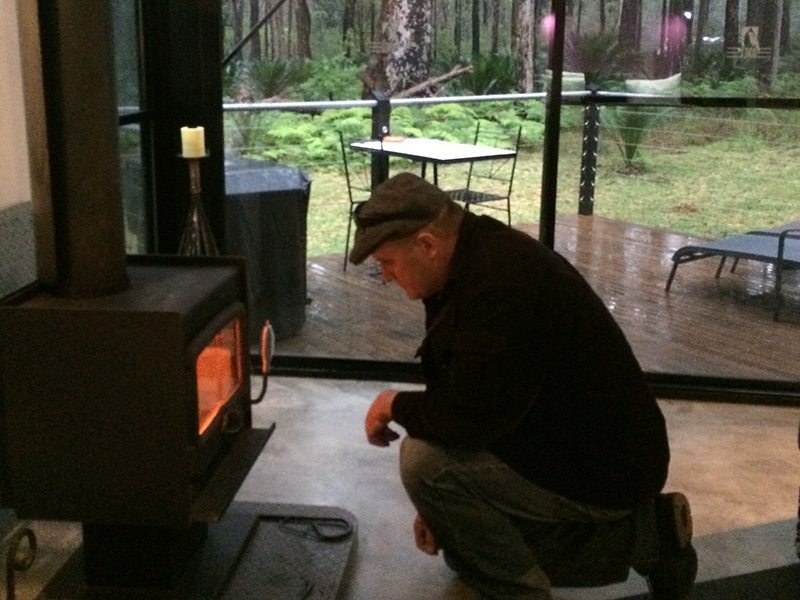 Gordon went to the fireplace and lit the pre-prepared fire as we listened to the sounds of the rain outside and the soft tunes of the owners choice of greeting music on the CD player. The bathroom has one of the largest spa baths and huge windows overlooking the bush, candles waiting, and thick towels and under floor heating. 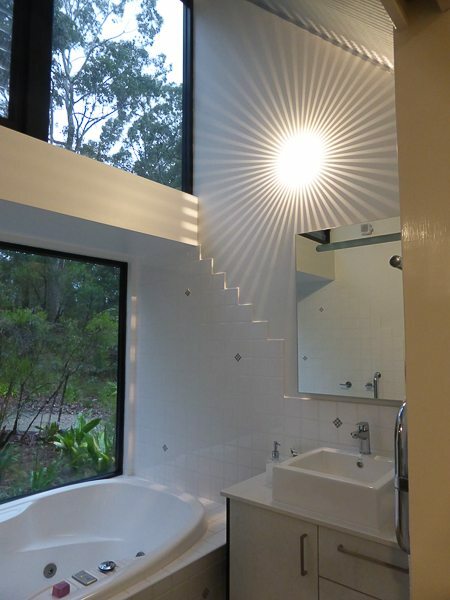 A separate and beautifully decorated shower is in a large recess. There are speakers in the bathroom so that when you do use the spa bath, and we did, you have the entire romantic thing happening. The only thing that was missing from this idyllic romantic setting was a bottle of bubbly to embrace romance and alone time. The living area has floor to ceiling cathedral windows leading to a balcony. Here there is a comfy lounge and oversized cushions, tv which is not needed with all of this beauty surrounding you, and a stunning light fixture that is also seen in the bathroom. There is a kitchen with everything that you need to prepare a meal. You can order a bespoke hamper should you choose or visit a restaurant in one of the towns that are a little drive away. There is an adjoining dining area to enjoy the breakfast hamper that is left on the 1st day only. 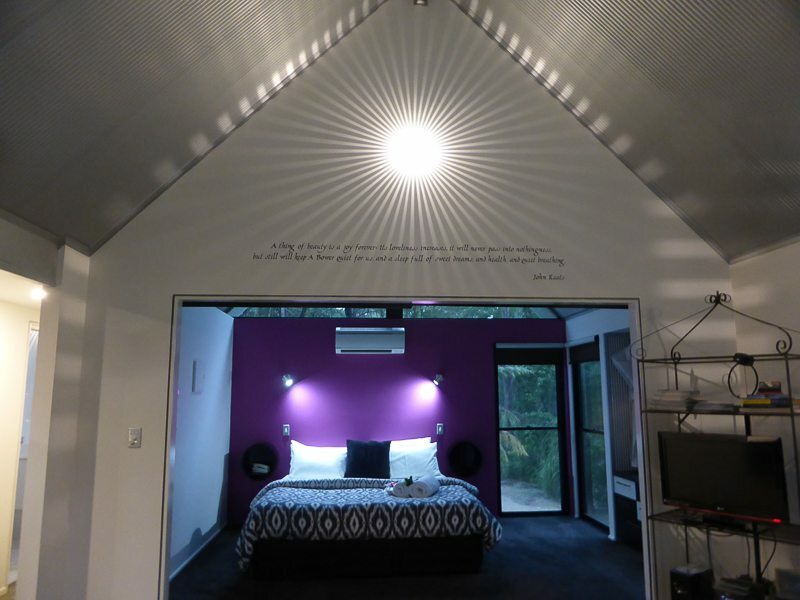 Our bedroom was a large king sized bed overlooking the bushland and needless to say was lovely. Bower at Broulee are eco-friendly bowers, and more can be read about this on their website. Each of the bowers is isolated from the each other and are literally in the middle of the bush. 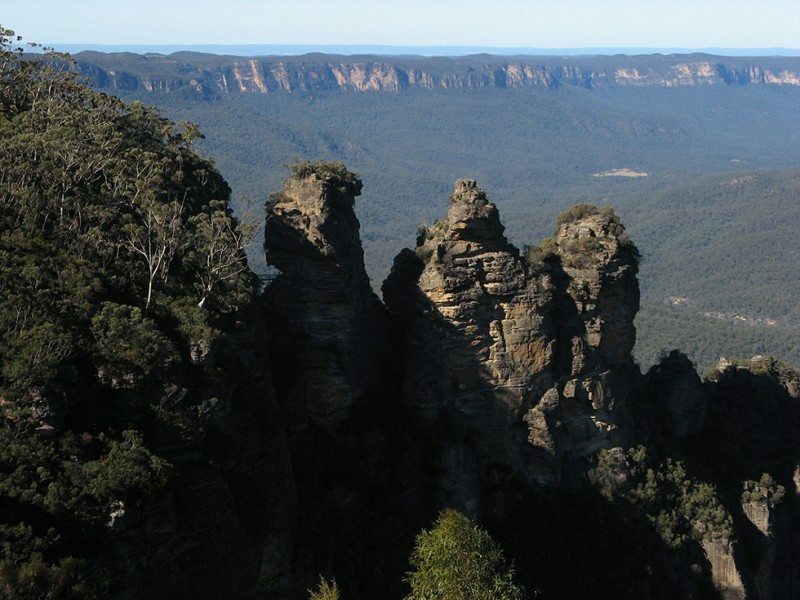 To discover more of your surrounds here, you can do the 2.2km Illawong Walk or the 5.5km Broulee Beach Walk. There are other walks to find more of Eurobodalla’s nature’s own playground as we did. Alternatively you can use the mountain bikes and explore to your hearts content. As I can’t ride a bike, I didn’t choose this option though Gordon went for a spin while I walked. I have heard it called glamping, but bower living is different. So, What is a bower? and how did our definitions go? Did the bower live up to the definition that we found in the dictionary? I would say The Bower exceeded the first definition, and if Gordon had not have been here, then I would have had my bower in the bush, satisfying the 2nd definition. But then, this bower was set up for romance, and it gracefully succeeds just as the bower bird probably did when they set up their romantic entrapment nest. The Bower at Broulee is a totally unexpected, fabulous, and luxurious bower in a unique environment. So very impressed. Just don’t forget the bubbles to complete an entirely romantic picture. Personally speaking, you write very well. I am fan of your blog, you always write very informative articles. Recharge, indeed. Australia has so much to offer! Thanks for taking us on a visit to your most amazing and lovely bower. Pretty special isn’t it. 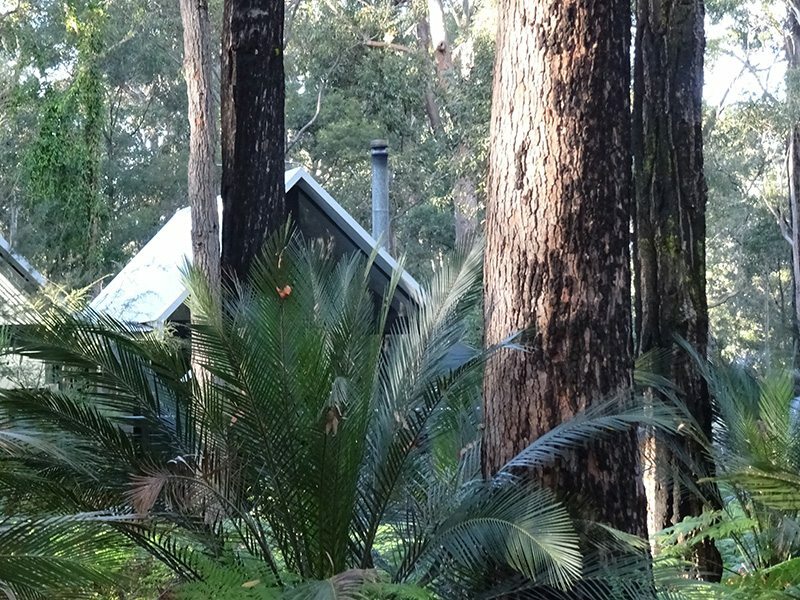 The bower, and that is cool in itself, was just chic and smack in the middle of the Australian bush.